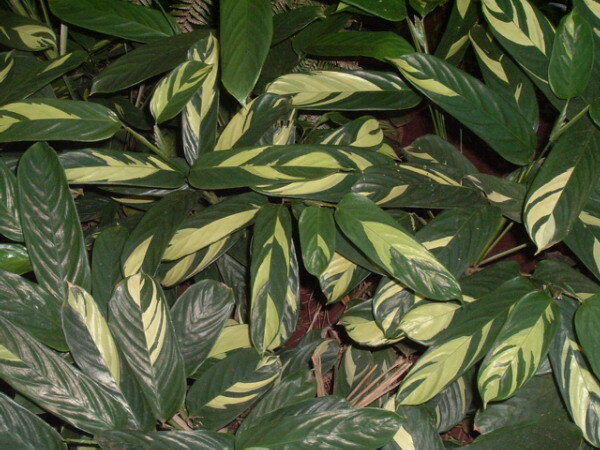 Arrowroot (Maranta arundinacea L.) is a tropical herb used for its tubers, which contain a highly valuable starch. The leaves and the by-products of starch extraction are fed to livestock. Arrowroot is a perennial glabrous herb that can grow up to 1.5 m in height. It forms thickets in shaded places. It has shallow roots and many cylindrical fleshy tubers (rhizomes) that can go deeper in the soil than the roots. Arrowroot is many branched. Its stems are slender and each bears one large (10-25 cm long x 3-8 cm broad) ovate and oblong leaf at its end. The flowers are small, white in colour, and borne in panicles (Ecocrop, 2015; Valdes Restrepo et al., 2010). Arrowroot is mainly cultivated for its starchy tubers. Tubers must be processed within 48 hours of harvest because they are prone to rotting. After being soaked in hot water, they are peeled to remove their fibrous covering in order to prevent a bitter taste and discolouration in the final product. They are then cut into small pieces and grated into a coarse pulp. Macerating the pulp breaks down the tough cells surrounding the starch. The pulp is then washed on screens to separate the starch from the fibrous material. The settled starch is then centrifuged or filtered to further separate it from fibre fines and other soluble material. The separated starch must be quickly dried and ground to powder. The root contains about 20% starch, and 17-18% can be extracted (Cecil, 1992; Kay et al., 1987). Arrowroot starch is one of the purest natural carbohydrates, with a high maximum viscosity. It is used in food preparations and confectionery, such as jellies and pastries. Since it is highly digestible, it is fed to infants and to people with specific dietary requirements. Industrial applications include cosmetics and glue (Göhl, 1982; Ecocrop, 2015). It has several ethnomedicinal applications (Kay et al., 1987). Production of starch from arrowroot yields several potential feed resources. The aerial biomass of arrowroot that is left in the field can be processed into silage (Erdman et al., 1984). The residue of starch extraction, called "bittie" in the West Indies island of Saint Vincent, has a high fibre content and can be fed to livestock (Erdman et al., 1984; Göhl, 1982; Valdes Restrepo et al., 2010). Arrowroot is native to South America. The Caribbean Arawak people considered arrowroot a staple and called it "aru-aru" (meal of meals). It is widespread in the tropics and has been mainly grown for starch in Saint Vincent, where 95% of the commercial supply was produced, in 1987. However, production in Saint Vincent declined from 143,000 t in 1999 to 58,000 t in 2004 (Kairi, 2008). Other countries, including the USA (Florida), Brazil, the Philippines, India, Sri Lanka, Indonesia, China, Kenya, Rwanda and Tanzania have been reported to grow arrowroot (Kay et al., 1987; Munguti et al., 2012; Abun, 2005). The arrowroot starch manufacture that existed in 1870 in Florida had disappeared by the 1950s (Burkhardt, 1952). In the 1980s, there was renewed interest for arrowroot production in Florida (Erdman, 1985). Arrowroot produces better crops in the tropical lowlands, but can be grown at altitudes of up to 900-1000 m above sea level (Ecocrop, 2015; Kay et al., 1987). Arrowroot grows in places where average temperatures are between 20 and 30°C, and where annual rainfall is between 950 mm and 1500 mm. Arrowroot requires a good water supply, evenly distributed during growth. It does better in deep, friable, well-drained and slightly acid loam soils. Some shade may be useful when it is grown on light soils (Kay et al., 1987). Arrowroot starts flowering about 90 days after planting, and the rhizomes are mature after 10-11 months (Kay et al., 1987). Harvesting operations can start when foliage starts to wilt. Successive crops are usually grown on the same land for 5-6 years (Ecocrop, 2015). Root harvesting is usually done manually. The plants are dug up and the tubers separated from the leafy stems (Kay et al., 1987). Mechanical harvesting was reported to be difficult (Erdman, 1985). Yields range from 10 to 35 t/ha of rhizomes, from which 2.5-7.5 t/ha of starch can be obtained (Ecocrop, 2015). Processing arrowroot for starch may have detrimental effects on the environment. It was reported to use too much clean water in Saint Vincent. The intensive mono-culture of arrowroot required lead arsenate, which contaminated the soils (Simmons et al., 2000). Arrowroot foliage is very rich in protein (18-34% DM), fibre (ADF 30%) and ash (9-15% DM). The by-product of starch extraction has a very low protein content (< 5% DM) and a very high fibre content (NDF > 75% DM). Coarse residues (coarse bittie) contain more fibre than fine residues (fine bittie) (ADF 27 vs. 19% DM; Erdman et al., 1984). Arrowroot foliage fed at either 50 or 100% of the diet to lambs did not affect nutrient digestibility. It was concluded that arrowroot foliage could be used in a maintenance diet as a substitute for other medium quality roughages (Newton, 1986). Arrowroot foliage has a moderate in vitro DM digestibility (56%) but its high ash content reduces its value as a ruminant feedstuff. However, its protein content could support sheep and growing cattle. In any case, supplementation would be necessary. Silage tends to decrease the protein value and the in vitro DM digestibility (Erdman et al., 1984). A mixture of arrowroot root crown and roots fed at 100% to lambs was rejected and found unsuitable for use as a feedstuff, notably due to its high mineral content (30-55%) (Newton, 1986). Arrowroot starch by-products are low in protein and would require nitrogen supplementation (Erdman et al., 1984). Fine residues of arrowroot starch extraction were reported to be used for pig feeding in the Philippines (Basa, 1989). Fine residues from arrowroot starch extraction were reported to be used for poultry feeding as a substitute for maize grain in the Philippines (Basa, 1989). In Indonesia, several trials have investigated the value of arrowroot starch residue fermented with Aspergillus niger. The fermented product had a slightly higher protein content (6 vs. 4% DM) and lower fibre content (crude fibre 10 vs. 16% DM) than the raw product, and it could be included at 15% in broiler diets without negative effects on the protein efficiency ratio and feed conversion, and at up to 10% without effect on DM and protein digestibility (Abun, 2005; Abun et al., 2005). Information on the utilization of arrowroot products in rabbit feeding is limited. In a 30-day study, growing rabbits were fed pelleted diets containing 60, 80 and 100% arrowroot foliage or 90% arrowroot starch by-product. Daily gain, final weight and feed conversion were lower with all test diets when compared to the control diet. The 60% and 80% arrowroot foliage starch did not affect carcass yield and sensory evaluation of muscle in colour, taste, texture and overall acceptability. The 90% arrowroot by-product did not affect meat sensory evaluation. No toxic effects were detected from feeding arrowroot foliage and starch by-products to growing rabbits (Erdman, 1986). Arrowroot leaves have been cited as a common ingredient for Nile tilapa (Oreochromis niloticus) and African catfish (Clarias gariepinus) in Kenya, Tanzania and Rwanda (Munguti et al., 2012). Kairi, 2008. St Vincent and the Grenadines country poverty assessment 2007/2008: Living conditions in a Caribbean small island developing state. Report on the institutional assessment, KAIRI, Final report, vol 3.